When I moved back to California, I knew my life would change. That was the whole point. I wasn’t sure what I was going to be doing but one thing I did know was that I wanted to paint again. I had no idea what exactly that would look like. When you make a major life transition, it can’t help but toss everything up in the air. I recently watched Marie Forleo’s video interview (thank you Kim!) with Steve Pressfield. A successful author, he writes about war – external and internal. In Do The Work, he describes the internal battle that springs forward when your higher self decides to go for your dreams or any new goal or do anything remotely outside of your comfort zone. Because the job of the ego is to keep you safe, it creates resistance to your new plan. Then Pressfield outlines a series of steps to deal with resistance; the first step being to decide on the theme of your project. So, I got to thinking about my work, what I’ve done so far and where I want to go. I’ve experienced a lot of frustration lately wanting to paint really big and abstract, and then being drawn to smaller, quieter subjects using the glazing technique I know and love. I feel like I’m all over the place. And that makes sense given the last couple of years. But I am also very familiar with my own resistance. So what I’ve decided to do is just allow myself the freedom of finding my theme. It may be something I’m currently exploring or it may not. I don’t have a clear picture yet. What I do have is frustration. It didn’t feel right to paint out like the Anger canvas, so I rounded up some color markers. I let myself feel the frustration as I began moving my hand over the paper, intentionally NOT thinking, or if thinking, letting the thoughts go, one after the other. Focusing on the movement of my hand, I picked up the next color that felt right and kept moving. Most important was letting the frustration all out onto the paper. When I finished one drawing, I went on to the next. Looking at them all, I again had the revelation that everything is already within. All we have to do is allow. These images look remarkably like figure drawings I was doing many years ago, before I took life drawing and learned to render the figure academically; the identical experience I had after I did the second anger canvas. It’s all energy just waiting to be expressed. So rather than being upset with myself and going down the road of self-condemnation for not having it all figured out, I’m going to surrender again and enjoy this new phase of my journey: searching for my theme. Which for me also means searching for my own voice, my own manner of expression, and my own way forward. The other day I was on my way to meet a friend for dinner. I had a few extra moments and decided to stop at a used bookstore I’d been wanting to visit. The ART section was right up front. I was in my zone, contentedly browsing for artists or titles I’m currently interested in when my eyes landed on a book called Art and Healing by Barbara Ganim. As dinnertime was near, I quickly purchased the book and went on to meet my friend. When I returned home, I sat down to read and quickly felt my heart begin to beat more rapidly. 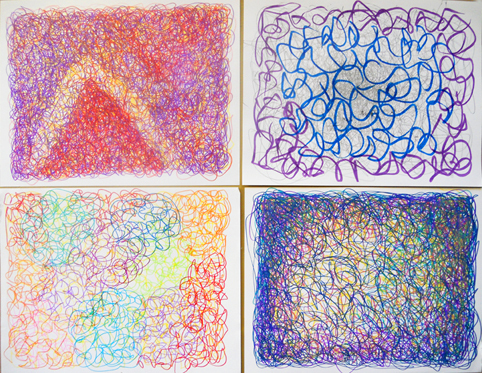 Here was my experience with the Anger canvas all laid out as a process. But what really got my attention is the author’s declaration that WOMEN ARE ANGRY and we are still holding it all inside. She goes on to describe the many negative effects that this has on our life, our relationships and our health. Holding anger inside can literally make us sick. And using art as a way to express not only anger but also the complex layers of our inner worlds is an extremely powerful tool for healing. And for revealing. Even though none of this was real news to me, I had one of those life-changing moments where I felt my whole world open up: all the pieces, all the answers coming together into one cohesive picture: art and images are powerful tools for transformation and healing. 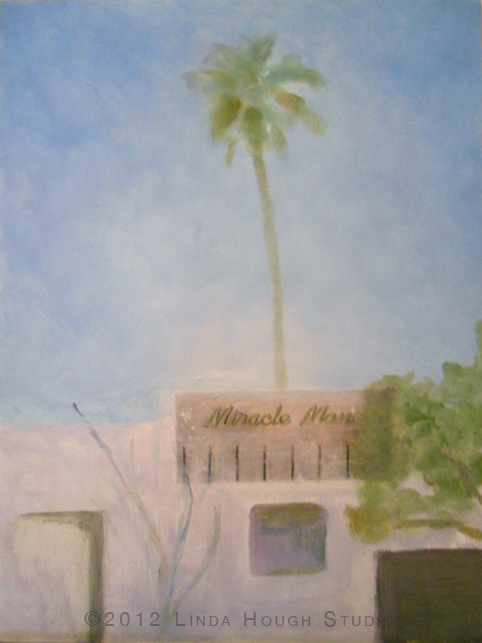 As soon as I returned to Palm Springs, an old desire surfaced: to paint the desert hotels and houses that were etched in my mind growing up. At the time, I didn’t realize that they were part of the mid-century modernism design movement. To me, they were just the buildings I grew up around. So now that I got that big anger expressed, and some big mountain energy going, I’m settling in to work on this series. I took a number of photographs of Miracle Manor Retreat, a renovated mid-century modern boutique spa in Desert Hot Springs. Key to the work would be the neon sign that graces the top of the entrance. How to depict that accurately? After trying on my own to replicate the sign, I resorted to technology. Using a process called image transfer, I was able to get the look I was after. Then, I began blocking in the larger shapes. Next, I’ll refine the details and add ‘the glow’. My new desert series is in progress! The Anger Canvas unleashed a whole lotta emotion that had been pent up inside for WAY too long. Each time my brush touched the canvas, I let more and more go. It felt so good that I went on to another canvas. Rather than the extreme emotion of the first, this seemed to be more a dance of anger. There was a rhythm and balance to it all. Just getting it out was the important thing. Not worrying about anything but pure uncensored expression. Whew. Huge deep breathe. NOW I can paint. The release triggered a breakthrough whereupon I am feeling the floodgates opening. I am struck by the similarity in gesture this painting has with my weavings. There is a constant thread running through our lives if we but stop to observe. 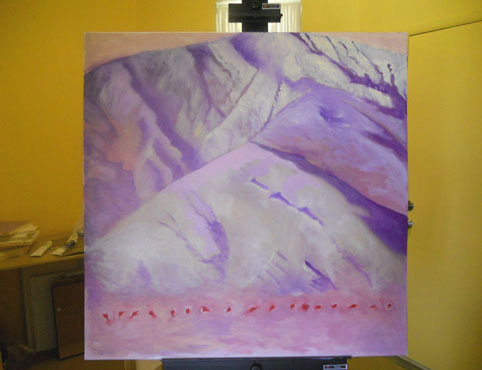 Here is an under-painting of my beloved mountain. Nothing like a solid foundational landmass speaking of strength and beauty to get me started again. The landscape in the south of France is decidedly feminine. That’s mostly why I felt so at home there. And though my mountain here is rugged, I feel her emanating a strong feminine energy as well. This weekend in the high desert was the ShaktiFest: A Celebration of the Divine Mother. Though I was not able to go, I pursued the website with interest. Another flood of emotion washed through me: memories of my time in India where the divine feminine has been honored and respected for centuries. And suddenly it all came together for me. Again I ask, how did I stray so far away from my path? It was there all along, the underlying currents that make up my life. And I chose to ignore them…until now. 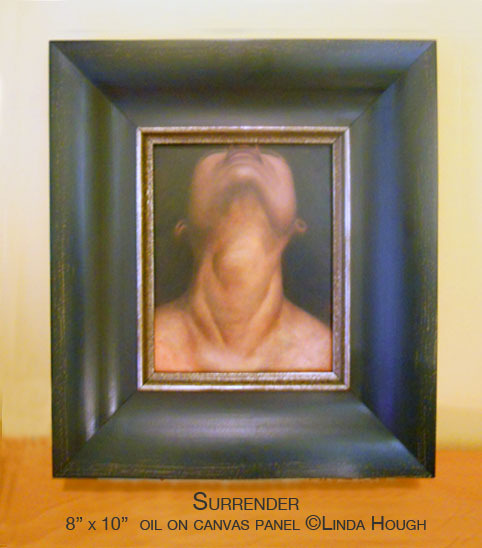 In this painting done many years ago, I capture the notion of surrender. And that is where I am again. 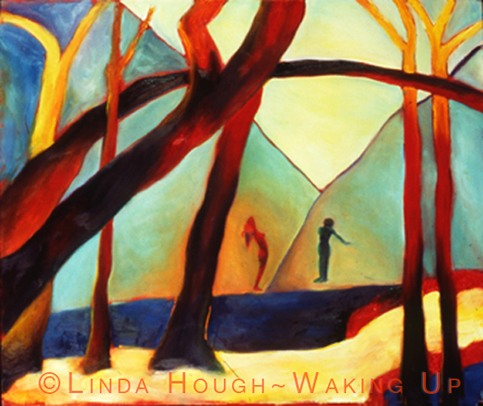 Surrendering to what is before me, what is here now, what I’ve come here to be and do. I surrender to truth, beauty, freedom and love. I surrender to it all so that I may naturally and completely embrace my own divine life. Many weeks ago, I wrote about preparing my panels and what a great discovery I’d made in the process. That experience completely energized me. I was so excited to be painting again. So excited that I looked at all those small panels and thought, no WAY those itty bitty things can hold all the expression I’m feeling. 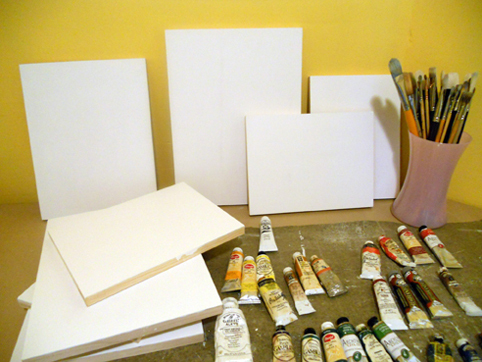 I want to paint with big ~ sweeping ~ gestures, using the whole of my body, on a much bigger canvas. But I’d already put time, effort and energy into these little guys. 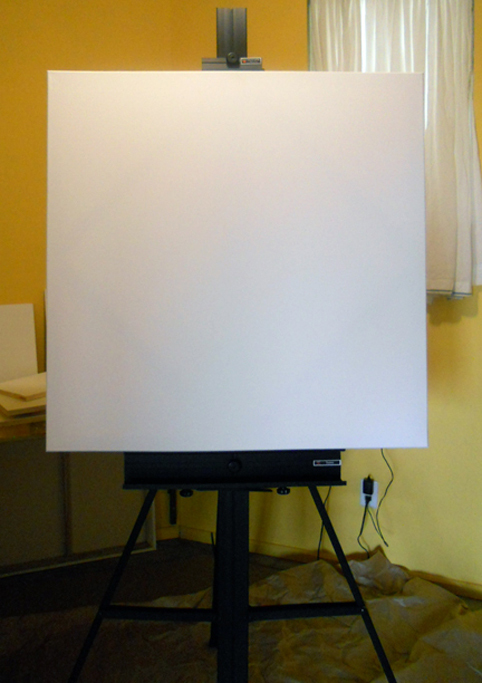 For days, I argued with myself…But I already…But I want to…Finally I went out and got the larger canvas. Then life got away from me. More weeks went by. So many OTHER things to do. Big canvas, big gestures, big exposure. Did I really want that? To be seen that large? Wouldn’t I rather stay tiny and small? You’d have to walk up to the little panels to really see what was going on. Much safer than such a large canvas calling out to people from afar. More inner arguing occurred. But the need to express in big gestures won out. Even if no one ever saw it, I needed to experience it, release and let go. Standing in front of a blank canvas after days of staring at it and years of not painting, I suddenly felt anger well up within me. I’d imagined this moment many times. What would I paint? What colors would I choose? What form would they take? 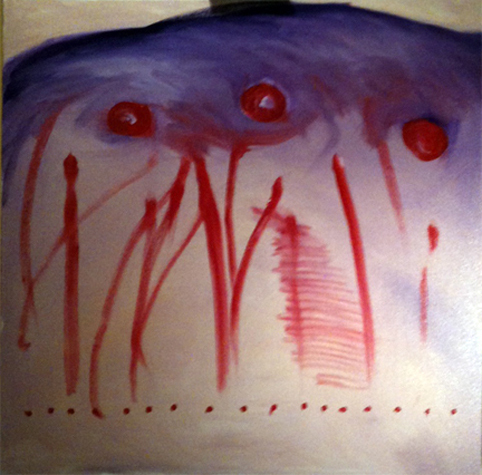 And many times, what I saw in my mind’s eye were the bold red slashes of a knife cutting through the canvas. Repeatedly. Accompanying those slashes were years of stored anger. Where had I gone so off track? Why had I stopped painting? Why did I abandon my creative self? The anger kept coming and coming. 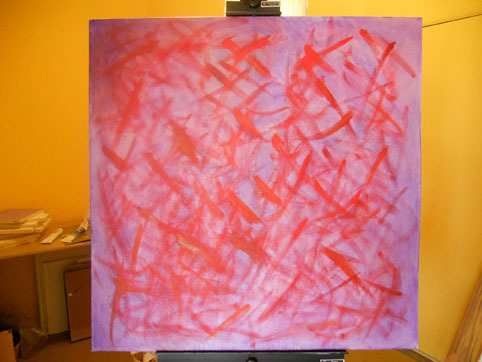 So I stood squarely in front of the canvas and let the slashes come out. Lunging into the canvas with each slash, feeling the full force of emotion, using the whole of my body. My big expression was full of anger! Taking a step back, I surveyed my progress. With one grand release, I felt SO MUCH BETTER! A huge sigh of relief rushed through me. I was back! Back to standing in the truth of who I really am. And back to letting my creative spirit have a voice. She’d been shut out of my life for far too long. And that created not only anger but also sadness and a total lack of energy for life. No wonder I always felt depleted. I was missing my best half! If you suffer from bouts of anger, sadness or depression, I encourage you to find some sort of creative outlet and let yourself experience the freedom of your own bold red slashes. Better to be expressed through paint, drawing or writing then aimed towards someone you care about.